Let logged in users pay at WooCommerce checkout from their cryptocurrency wallet. This plugin extension is a payment gateway for WooCommerce. Once you install the Bitcoin and Altcoin Wallets WordPress plugin, the users who subscribe to your site can maintain account balances in Bitcoins and various other cryptocurrencies. This payment gateway lets them spend this cryptocurrency to pay for orders from your WooCommerce e-shop. Works as a WooCommerce payment gateway. On checkout, the buyer selects a cryptocurrency to pay with, from a list of sufficient coin balances that the user owns. The plugin performs an internal payment to the designated admin account. Displays product prices in an arbitrary number of altcoins that you have set up, using the Exchange rates feature of the parent plugin to retrieve prices from major exchanges. Your coin is not listed in a major exchange? You can still add the exchange rate of your coin with some minimal coding. Supports issuing refunds via WooCommerce. An amount is sent to the buyer via an internal transaction. The amount is equivalent in value to the original purchase, as expressed in the main WooCommerce currency. This can be a fiat currency, to guarantee that product prices remain stable. Refunds are paid in the same cryptocurrency coin as that paid on checkout, but the amount is adjusted based on current exchange rates. Works as a WC Marketplace payment gateway. When there are vendor commissions to be paid, they are paid to the vendors from the designated admin account. Install and activate the Bitcoin and Altcoin Wallets WordPress plugin, WooCommerce and this extension. From the left-hand side menu, go to WooCommerce → Settings → Checkout → Bitcoin and Altcoin Wallets. Select an admin account that will receive cryptocurrency payments, then click on Save Changes. If using WC Marketplace, then visit WCMp → Settings → Payment → Bitcoin and Altcoin Wallets. Select an admin whose wallet will pay the commissions, and the cryptocurrency that will be used to pay them, then click on Save Changes. From the left-hand side menu, go to Settings, and select Activate dashed-slug.net plugins. After registering at dashed-slug.net you will have received an activation code in your e-mail. This code is also available In the provided text field, please paste your activation code exactly as you received. Check that the Bitcoin and Altcoin Wallets plugin is installed and enabled. Check that at least one coin adapter is installed and is responding. Go to Admin → Wallets. There should be at least one cryptocurrency with Adapter Status: Responding. Check that your user is logged in. Users can only use this gateway to pay with balances that are associated with their accounts. Users who are not logged in will not see this payment option. Check that the payment option is enabled. Go to Admin → WooCommerce → Extensions → Checkout → Bitcoin and Altcoin Wallets → Enable/Disable. Make sure that the checkbox is checked. Currency rates are calculated using the fixer.io API and a choice between bittrex/poloniex/novaexchange APIs. If for some reason one of those APIs is not contactable from your server, exchange rates will not be available to the plugin and therefore the payment option will not show. If you still you do not see this plugin as a payment option, then please report your issue at the support area. Make sure that you have enough funds on the user that you are using to test the checkout, including the internal transfer (move) fee. If you do not have enough funds, the gateway will let you know. You cannot checkout if you are logged in as the admin account that you have designated in the payment gateway options. To test the checkout process, log in as a different user. Your customers can only pay with cryptocurrencies whose value can be converted to the default currency of your shop. Go to Exchange rates in the admin menu, and select an exchange rates provider that includes the rates needed. For example, if your shop lists prices in USD, and your customer tries to pay with Litecoin, you will need to have the LTC/USD exchange rate loaded, or the LTC/BTC and BTC/USD rates. If the default currency of your WooCommerce eshop is a fiat currency (such as USD or EUR), you will need to also enable the Fixer.io exchange rates provider (see this relevant blog post). You can check which exchange rates are loaded in the debug view near the bottom of the admin screen (Exchange rates box). how do I set product prices in other cryptocurrencies? You don’t. Cryptocurrency prices are often more volatile than those of fiat currencies. The products in your e-shop are priced at the base currency that you have selected in the WooCommerce settings, as usual. This would typically be a fiat currency (although nothing is stopping you from choosing one of the available cryptocurrencies as the base currency). When a logged in user requests to check out an order, they see the total price of the order in the base currency, and also calculated in Bitcoins or any cryptocurrency that is currently enabled in the Bitcoin and Altcoin Wallets plugin. If there is at least one cryptocurrency available, the Bitcoin and Altcoin Wallets payment method becomes available along with any other payment methods you may have installed. If the user chooses this payment method, they are instructed to pick the cryptocurrency that they wish to pay with, from a simple drop-down. 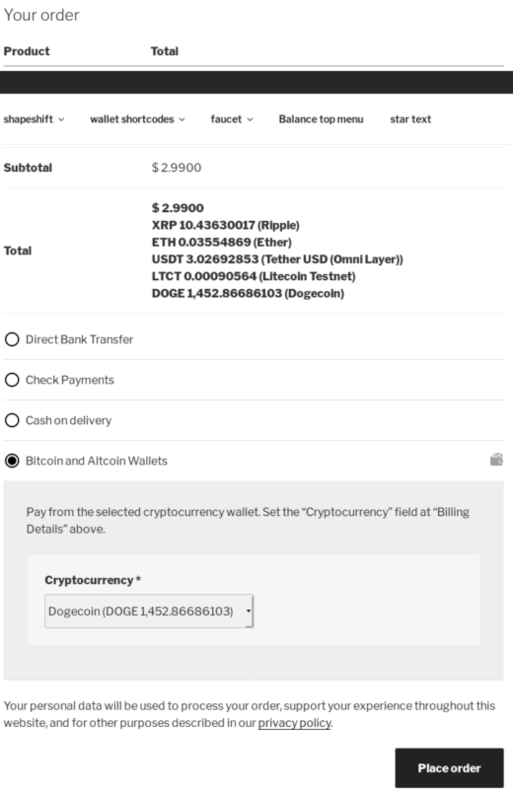 When the user finally hits the checkout button, the amount is transferred from their cryptocurrency account to the account of an administrator that you have previously selected (see installation instructions, above). 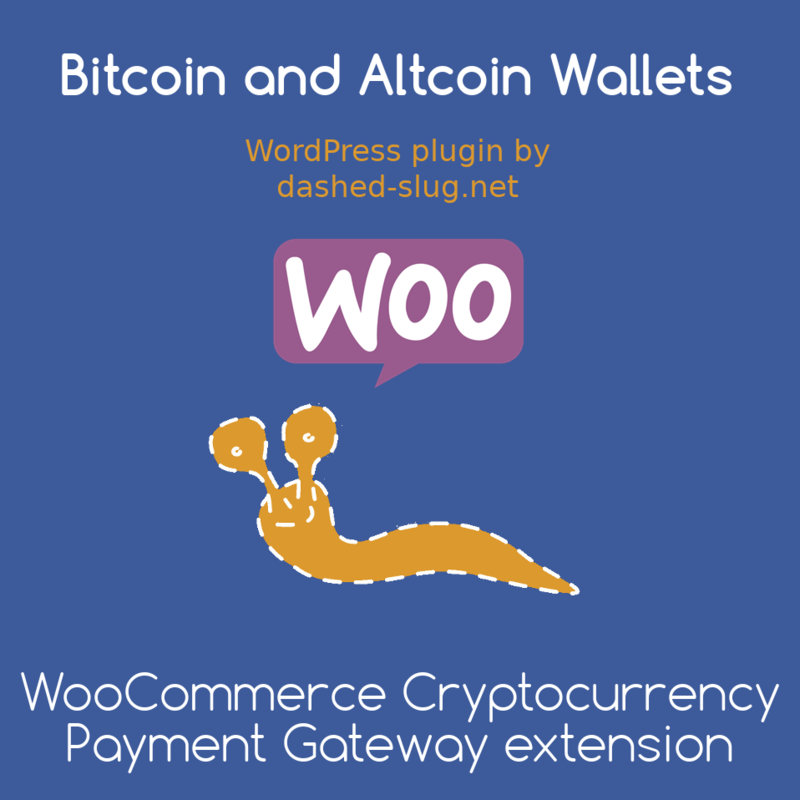 why not use another bitcoin payment gateway for WooCommerce? If you simply want to enable Bitcoin payments to your e-shop, there are certainly other solutions out there that will also do that. The goal of the Bitcoin and Altcoin Wallets WordPress plugin is to provide an ecosystem of extensions that will let a user accumulate balances to your site via multiple streams, and let them spend those balances in multiple ways. Think of it as a customer loyalty program. Updated on 2018-12-14T20:24:21+00:00, by alexg.